and then enter the new password when prompted. You will notice there are two pools already. These are the default server pools and are not recommended for production usage. A new connection pool is needed for PostgreSQL, which you can create by clicking the New button. Now to create a connection pool. For this tutorial the admin console will be used, but this can be done using asadmin commands or web.xml. The pool name is how the connection pool is to be referred to within Payara Server, for this tutorial I will call it postgresqlpool. 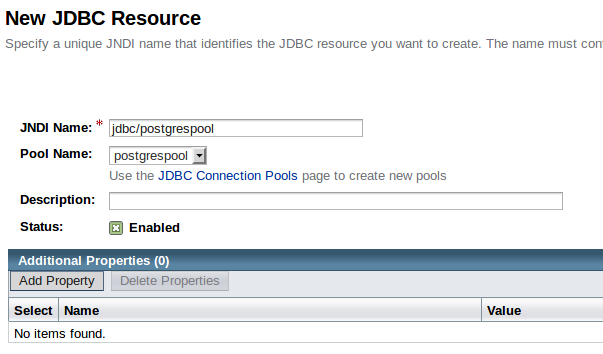 Set the resource type to javax.sql.DataSource and the database driver vendor to PostgreSQL. Then click Next. serverName – this is the location of the PostgreSQL server. Put in localhost. User – the username for the database. In this case the default account which we edited earlier, postgres. password – the password that you specified earlier. In production environments it is recommended that you use an alias. See Payara Documentation for more details. You can leave the rest of the fields blank for now. You can test the connection by clicking the ping button once the pool has been created. For more information on connection pools see the blog post here. Enter the JNDI name that you wish to use within your applications and set the pool name to be that of the pool set up in the previous step.